As he has done with many aspects of Bucky's history, Ed Brubaker has rewritten this last mission in CA v5 #3,4,6. He reverts to Steve and Bucky guarding the drone as GIs, but with their costumes underneath the uniforms. Zemo arrives with some German soldiers instead of giant humanoids. They capture the duo, and torture Bucky on an island in the English channel. The next thing we see is Cap and Bucky chasing the drone, with no indication how they escaped. Rather than staying on the drone to try to defuse it, Bucky is shown trapped by a snagged sleeve. Later we learn that only that arm was destroyed in the subsequent explosion. The torture and trapped arm are described as details Cap had forgotten (or suppressed). I'm not sure why they were additions necessary for Bucky's survival as the one-armed Winter Soldier. The recent CA Index tries to sew the accounts together. 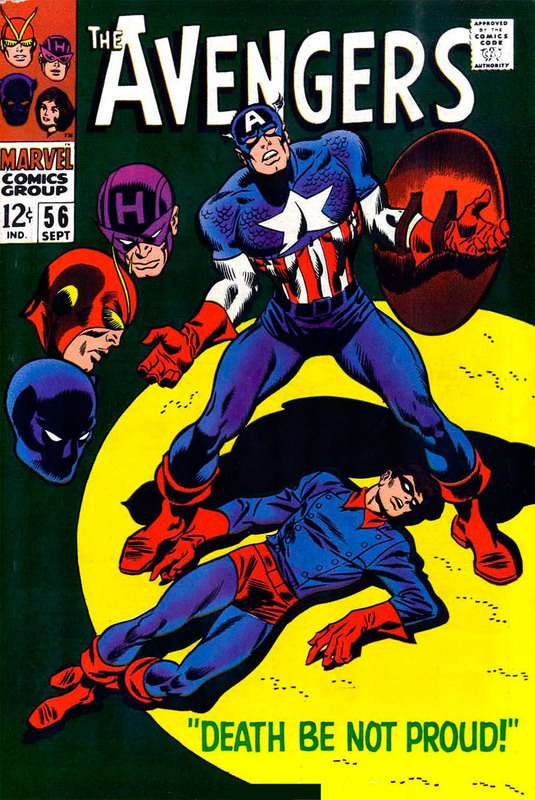 It has Cap and Bucky fighting Zemo and his humanoid, captured and tied to the drone plane on the English mainland. It makes no mention of the visit by the future Avengers. Then Zemo has the plane taken (flown?) to the island where the torture takes place. Cap frees himself and Bucky (from being tied to the drone again? ), Zemo launches the drone, and so it goes. Despite my quibbles I'm giving this issue a rare 5. It is an iconic story. And John Buscema's artwork doesn't do it any harm either. Annual #2 immediately follows this issue. After that #57 introduces us to the Vision, and in #58 Cap, Iron Man and Thor visit to induct him into the group. The original flashback said Steve and Bucky were guarding the plane as GIs. Roy Thomas has them arriving as Cap and Bucky, and Zemo dresses them as GIs. I would guess this is to explain how Zemo knows they are Cap and Bucky. Zemo escapes in an aircraft that looks to me like the one he will later use in #6. After all this trouble, does Cap actually see any more evidence that Bucky really died than he already had? (And of course he's wrong anyway.) Wasp has developed a favourite costume she keeps returning to. 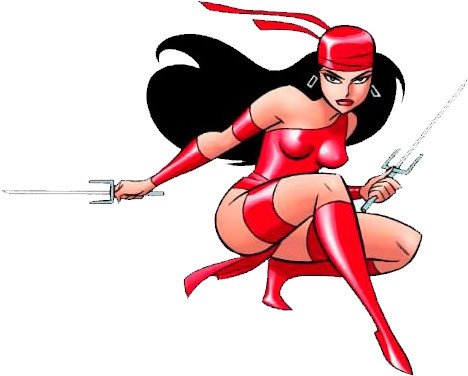 This one was the first costume of her millionaire phase in #45. It was seen again #51 and #53, and she will continue to wear it from now on for many issues, except #58 where she tries another one-off outfit, and #61-62 where she's absent on honeymoon. Roy will repeat the expanded story including the giant humanoid at the beginning of What If #4, this time from WWII Cap's POV. Because he was unconscious while the Avengers were visible, the only inexplicable thing Cap sees is the shield which cuts his bonds. Mark Waid's version in CA: Sentinel of Liberty #12 follows pretty faithfully the What If story as seen by Cap. It adds a preamble where Cap and Bucky in costume stop Nazi soldiers infiltrating the drone base. And significantly it has Cap breaking free from the drone under his own power, thus eliminating the only reference to the presence of the future Cap. Captain America says Reed Richards told him about Doom's time machine a few says ago. This has recently been contradicted by CA: Man Out Of Time #3 where Cap learns about it before the bulk of Avengers #5. Reed moved Doom's time machine to the Baxter Building before Fantastic Four #23. But since then he built a duplicate (as will be later seen in FF Annual #11), and returned the original to Doom's castle after diplomatic protests. (This doesn't explain why Cap doesn't use the FF's duplicate.) Black Panther senses some menace in the castle. This, and Wasp's falling asleep and pressing a particular button, will be explained in Annual #2. It isn't stated clearly but the time machine must have 2 modes of operation, intangible observer and full participant. Reed has warned them to only use the intangible mode. Wasp's duties at the controls are confusing. She is told to manipulate them at regular intervals to avoid dire consequences. But it is an actual button push that later makes the Avengers tangible. We are also not told what makes them intangible again, and brings them back home. This is an expanded version of the scene from #4 where Zemo watches Cap and Bucky in GI uniforms try to stop the explosive drone plane. Everything before that is new. Captain America calls the four Avengers to Dr Doom's American castle, abandoned since Fantastic Four #5. He wants to use Doom's time machine to go back to see if Bucky really died in WWII. Black Panther, Goliath and Hawkeye elect to go with him. Wasp stays behind to (wo)man the controls. As planned they arrive on the fateful day invisible and intangible. The idea is to observe only. Reed Richards warned them that two versions of Cap existing in the same time and place could be catastrophic. They see Cap and Bucky trying to stop Baron Zemo stealing an experimental drone plane. Zemo grows a giant humanoid from a small 'seed' to protect him, and Cap and Bucky are KO'd by Zemo and his minion. Zemo then covers the heroes' costumes with GI uniforms, so they won't die as his hated enemies. The humanoid ties them to the drone, which Zemo is going to send to Berlin. At this point in the future Wasp experiences a sudden drowsiness, and 'accidentally' pushes a button which makes the Avengers materialise in WWII. Cap attacks Zemo, and a stray shot from Zemo's gun grows another humanoid. Both giants attack the Avengers and some GI guards who come to investigate the noise. But then the Avengers start to dematerialise again. Cap's last act is to send his shield to cut Steve and Bucky free, just as they are regaining consciousness. The once-more-immaterial Avengers see Zemo launch the drone, Steve and Bucky chase after it on a motorbike. Both leap for it but only Bucky latches on. The drone is booby-trapped. Steve falls into the sea, and the drone explodes with Bucky on it. The Avengers return to their own time. Cap is now convinced Bucky is dead. Wasp thinks her little sleep didn't do any harm. But Annual #2 which follows immediately afterwards will show that she's wrong. Plus: Baron Zemo, Goliath (Hank Pym).